Microsoft To-Do, the daily task manager that was born out of the company’s acquisition of Wunderlist back in 2015, has a new update rolling out that brings a host of improvements. The update, version 1.8.23 for those keeping score at home, fixes several issues with the task management app but also brings a new Quick add feature to the notification areas of your Android phone. 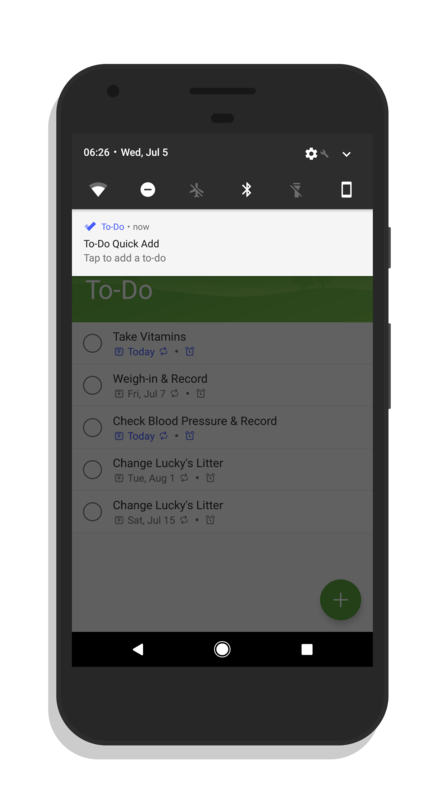 The new Quick add feature, when enabled, will put a notification for To-Do in the notification area on your phone. By tapping it, you can quickly create a new task which is added to your list in the app. All of this can be done without actually opening up the app itself. By default, this new feature is not enabled. If you want to enable it, go in the app to the menu, tap your avatar then find the Quick add notification setting in the General settings. Toggle it on and you are good-to-go. in a note that you created via native sharing has been resolved and, while not necessarily a bug, the issue where the default time for a to-do was set for the exact time when you created it has also been adjusted. Now it selects a time a few hours into the future automatically but you can adjust the reminder time. Finally, for those who are using Outlook Tasks, due dates were getting confused between the two apps. They should now look the same. Microsoft To-Do is a free app and available in the Play Store. If you have the app installed, look for the OTA update to this new build over the course of the next few days.